Email me if you are related, or have further information to add to the biography. Born in Croydon, Surrey on the 18th June 1914, only daughter of Willie George HOOD & Ethel Daisy (nee BERRY), and baptised at St James Church, Croydon on the 23rd August 1914. 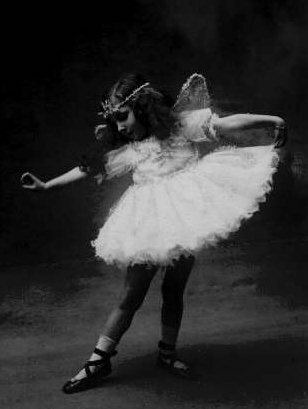 Encouraged into dancing following advice from her doctor, at age 4, to help her weak ankles. Attended the Ambrose School of Dancing in Redhill (at this time Pearl & her mother were living with her mother's father, Richard John BERRY, as Pearl's father was on service in France). Her early life (up to approx age 7) is described in her own words Pearl Hood's Book - early years autobiography. At age 16 (in 1930) was invited to take part in the 'First Company in History of British Ballet. 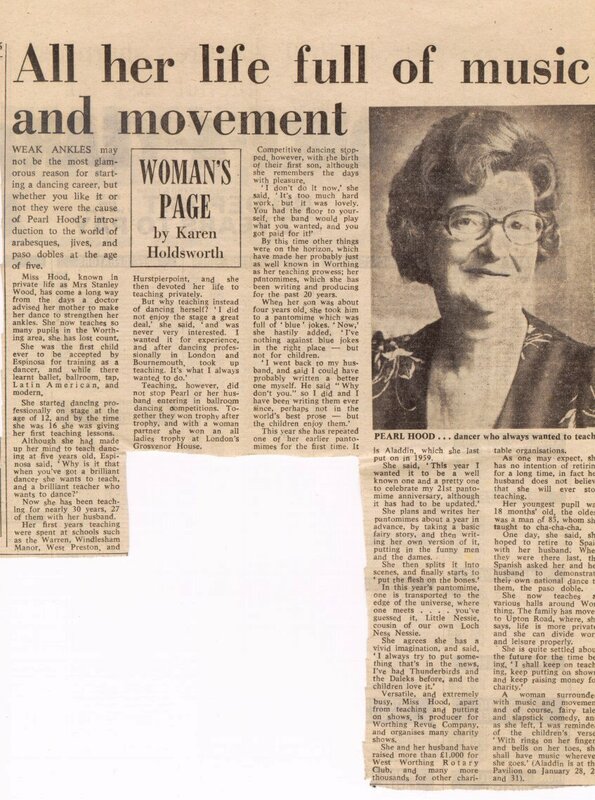 About the same time, or shortly thereafter, she started her first dancing school, teaching from a hired room above a pub in Sidcup High Street. It is assumed at this stage that she was living with her father's family in the Bromley area. The first indication of a dancing school in Worthing came with an advert in the Worthing Herald of 4th October 1933. The address given in this advert was 26 North Street, the home of Richard John BERRY who by now had moved to Worthing. In about 1936 Pearl (with her mother) moved into 13 Upper High Street, Worthing - which was to be her home until 1953. In early 1938, an RAF Corporal, Norman CUMBER, started to attend her School of Dancing, and gradually worked his way into Pearl's affections. 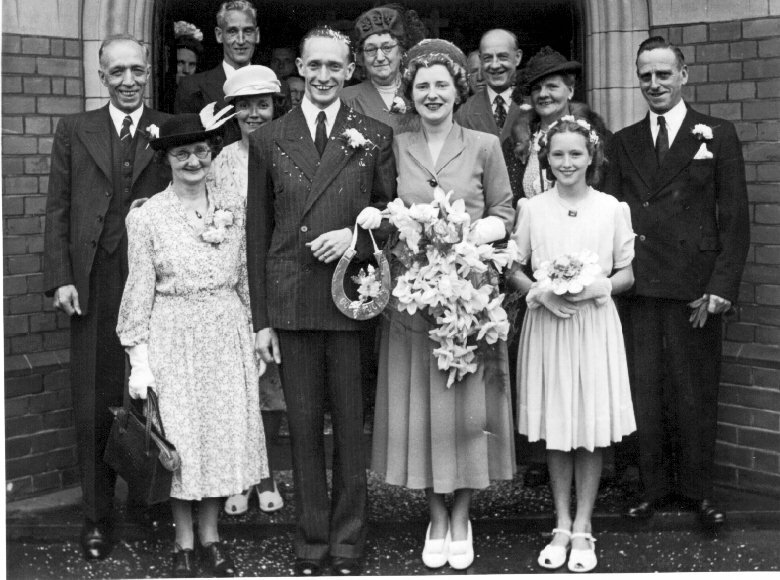 They married on 9 Aug 1940, at St Pauls Church in Worthing. The marriage is believed to have not lasted very long, although Norman CUMBER did attend the funeral of Pearl's mother (5th June 1941). 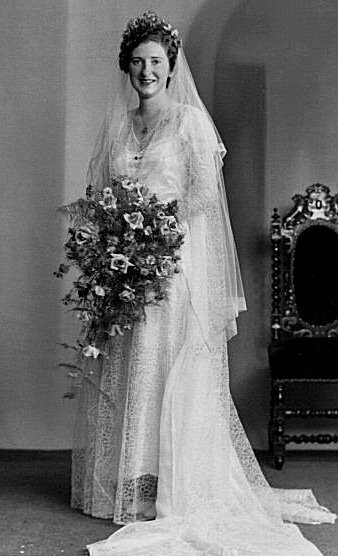 They divorced 2 Mar 1948, presumably to allow Pearl to marry Stanley WOOD. During the war years, Pearl was an ARP Warden, and drove an ambulance - although it was not until after the death of her husband Stanley WOOD, that she once again learnt to drive a car. Her love of the theatre was satisfied through participating in Home Guard productions. She met Stanley WOOD through their mutual love of dancing. He was posted to Brighton in early 1943 for telegraph training after joining the Navy, and they corresponded during his war service in Ceylon. He returned to Worthing on leaving the Navy in 1946, and immediately gained his teaching qualifications & started teaching at the Pearl Hood School of Dancing. They married 2 Aug 1948, at the Shelley Road Congregational Church, Worthing. Initially they lived at 13 Upper High Street, Worthing, which had been Pearl's home with her mother since the mid-1930s. The dancing school name changed from the 'Pearl Hood School of Dancing' to the Pearl Hood & Stanley Wood School of Dancing in approximately 1949. Their mutual love of dancing was expressed both in teaching & in competitions. They took part in the 1949 North England Dance Championship, and won the NATD Kimpton Trophy in 1950. Competition work ceased with the birth of their first son Barry Douglas WOOD on 24th November 1950, at Worthing Maternity Home. The family moved house in late 1953 to 51 Downview Road, Worthing. This large Victorian house was both a home & a place of business - a large double room running the length of the house on the ground floor provided an ideal dance studio. Since her early teaching days, Pearl had put on annual dancing displays, and this had continued, both on her own and with Stan. In 1956 she started to combine these dancing displays with potted (short) pantomimes. These annual pantomimes continued until Pearl's death in 1979. Pearl scripted the pantomimes, arranged the dances & produced the shows. Stan performed much of the administrative work - organising the hire of the theatre, printing of programmes & posters, advertising, and taking (and printing - in his darkroom) the photographs. Their second son, Keith Graham WOOD, was born on 21st April 1958, at 51 Downview Road. Stan's father had retired in 1957, and his parents moved into the new house with them some time in 1958; although after a family argument just before Christmas 1965, they moved back to Manchester in early 1966. 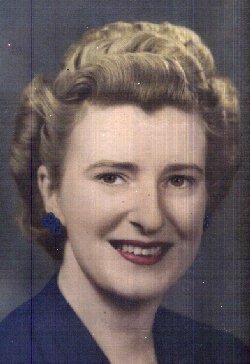 Stan's mother returned to live in Worthing in early 1970 after the death of his father. Stan died in April 1978, and Pearl survived him by about 18 months. She died on 2nd December 1979, at Southlands Hospital, Shoreham, Sussex.